They laser-focus your industry’s attention on a key topic. Despite this too-good-to-be-true marketing opportunity you may not be able to attend all or any of the key conferences for your specialty. Money. Conferences require a significant upfront investment. This includes conference fees, travel, out-of-town meals, hotel, and other costs. Time. Beyond actually attending the conference sessions, you need to add travel time and time out of the office. Also, you may have commitments outside of your office. Other reasons. In many companies conference attendance is considered a perk. As a result politics is involve as to who attends. But don’t let these constraints keep you from getting useful conference results from the main live events in your field or location. Instead, follow these 5 steps to get conference results without being there physically. Further, even if you plan to attend any conferences in the near future, these 5 steps ensure that you get the most out of your invest. If you can’t make it to the top conferences in your category, follow these 5 tactics and do the related work to achieve useful marketing results. BTW –They’re also a good starting point if you’re attending a conference in real life. While I strongly believe that attending conferences keeps you on top of the latest trends and connected with your peers. Life has a way of doing its own thing regardless of your plans. So you need a way to stay visible when you can’t be at a conference. Also, don’t overlook the power of conferences related to area experts within your organization. This is particularly true for businesses that employ scientists and other highly specialized individuals. Get their input on the key conferences they attend and how you can help them with their visibility among their peers. Regardless of whether you attend a conference or event in-person or virtually, preparation matters if you want to achieve measurable conference results for your business. To succeed you need a conference marketing plan to get the most out of the event. Base your conference plan on an analysis of the conference website and any other related content or marketing materials. Specifically, examine the conference agenda to understand the conference focus and theme for the current event. This guides conference content and sub-topics. How does the conference define their target attendees? 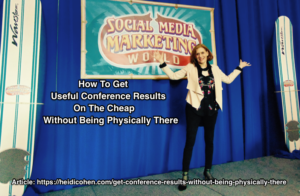 To get the best conference results, understand how their audience overlaps with yours. What level of experience or seniority do attendees have? What are the attendees’ hot button interests? Has the audience changed over the years? How have attendee needs evolved? Who are the keynote and breakout session speakers? Consider: How do they choose their speakers? Do they compensate their experts? (Do the speakers influence your audience? Are you interested in forming a business connection with them? If so, for what objective? Does the conference offer an established content offering? Which companies exhibit or sponsor the conference? As live media, conferences must generate revenues beyond their fixed event costs. Do you compete with the exhibitors and sponsors? If so, does your firm need to be present? How do their audiences compare with yours? Do they present opportunities for collaboration? Reach out to conference speakers and exhibitors. Take advantage of your homework to contact and/or connect with speakers and/or exhibitors that will help you achieve your business goals. To lay the groundwork to establish a business relationship with the key thought leaders and businesses in your category. So skip the automated, teflon LI or Facebook outreach. Specifically always add a personal note where possible and say more than I saw that you’re speaking at BLANK conference. Where appropriate read how they prefer to interact with people on social media. Instead use your outreach to strategically to build mutually useful connections to support your business and/or career going forward. Where appropriate, look for connections that can help give you an introduction. For example, I recently asked a colleague to introduce me to one of her co-workers. As a result, we discovered that she currently lives 2 blocks from where I grew up. Further, don’t be a snob and overlook people because they appear to be at a lower level of experience. Because you never know where they’ll wind up. For example, I always connect with students who reach out to me on LinkedIn. Since I’ve been teaching for a while, many of them now have high level positions. The key to networking success: Staying in touch! For example, Orbit Media’s Andy Crestodina holds office hours to connect with his followers. As one of the nicest people in marketing, Andy always pays-it-forward. Don’t wait until the day of the conference to find the relevant social media hashtags and profiles for the speakers and exhibitors. Instead, participate in the organization’s ongoing events. Build relationships before the actual events. Use your conference research to learn more about the people with whom you want to connect. Check their social media profiles and blogs. Also sign up for speakers’ newsletters. Because according to Ann Handley, email are personal communication like an old fashioned letter. As such they help you to know the writer. Further, the initial welcome email often asks for reader input. This gives you an opportunity to communicate with the speaker directly. Then engage with the speakers using social media and their blog in the comment section. Since many blogs have few or no comments, your well considered input gets noticed. 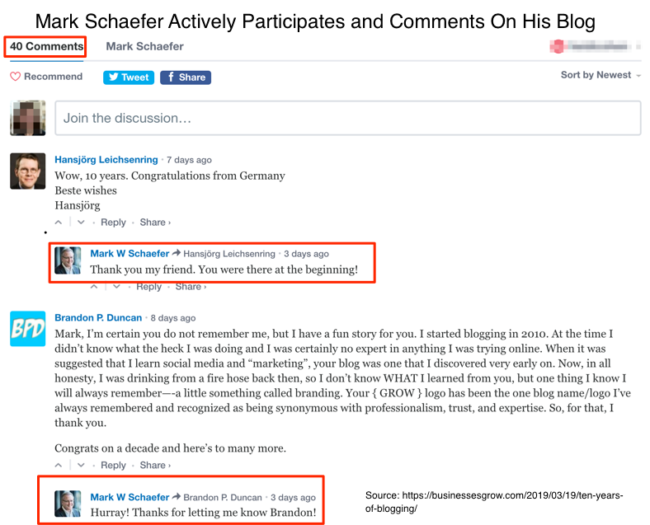 For example, Mark Schaefer always responds to comments on his blog. Mark Schafer’s Business Grow blog attracts up to 40 comments! Don’t limit yourself to the top social media platforms, namely Facebook, LinkedIn and Twitter. Find other outlets where attendees spend their time. When you’re actively following a conference hashtag in real time, let your followers know. This keeps them from feeling that you’re overwhelming their feeds. Since audience attention is a scarce commodity, schedule content, social media and related promotions around conferences to tap into the focused attention. Go further by including key conferences in your content and social media editorial calendars regardless of whether you attend or not. Further, based on your conference research you know how to position your content. Focus your conference content to take advantage of pre or start of conference excitement. 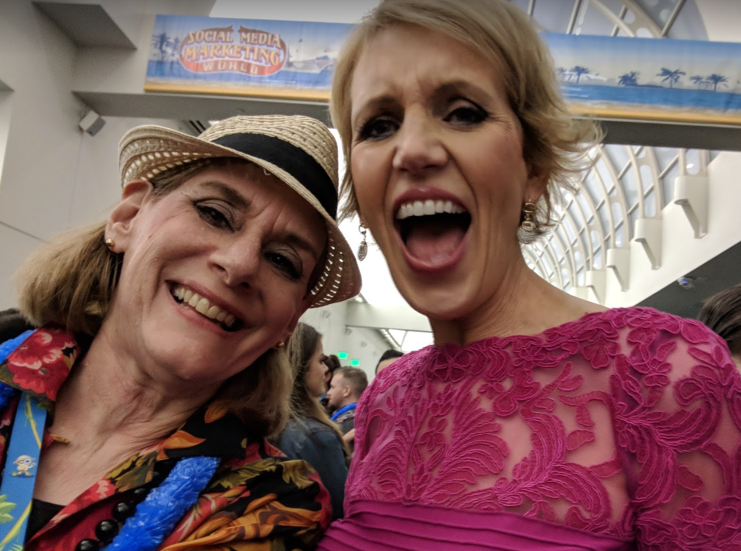 For example, I updated and published a cornerstone piece of content related to SMMW19 even though I didn’t attend the conference. 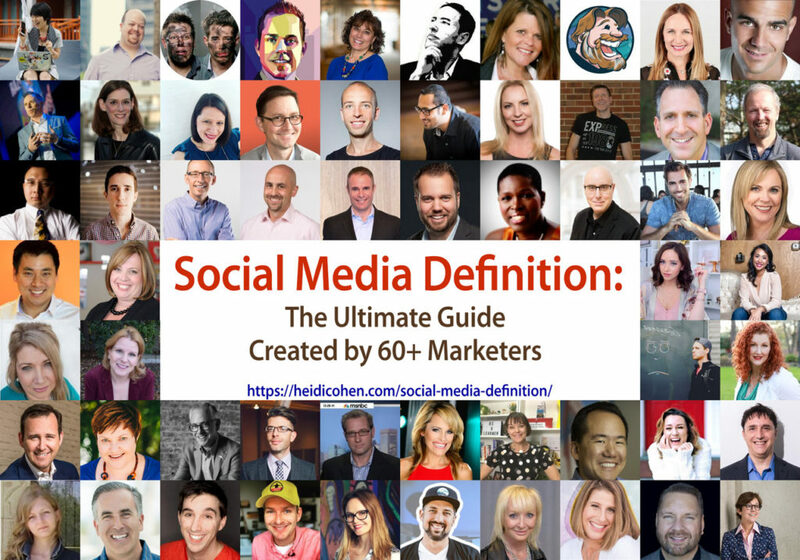 Since social media has evolved significantly since I first published my Social Media Definition post in 2011, I asked my social media colleagues to contribute their current definitions. Even better, I included each contributor’s Twitter profile photo and created a mosaic containing most of the contributors. Since shouting me, me, me on social media shows poor manners, curate relevant content from the speakers and influencers at the conference. Monitor the conference hashtag, speaker’s blogs and feeds, also check what the sponsors are doing/offering on their platforms. Curate and share the best of their content. Add context to your social media shares where appropriate. When possible aid attendees by supplying useful charts and data. Share other people’s content using their URLs and social media handles as well as the event hashtag. For example, during SMMW19, I shared my photographs from past years to remain visible even though I wasn’t at the conference. I tagged each photograph with the event hashtag and the social media handles of the people in the photos. Even better, I hadn’t shared these personal photos before. So it was like I opened the vault to past conference outtakes. And you can too! Here I am with Andrew and Pete and with Mari Smith! Conferences attract the audience attention you need to start to build relationships with prospects, customers, influencers and your audience. And you can do this from the comfort of your office, wherever it is. 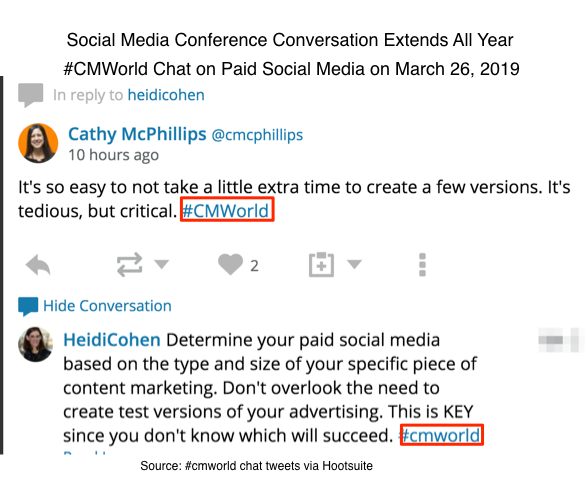 While I didn’t attend one of my favorite conferences, Social Media Marketing World 2019 I participated and engaged with my friends and colleagues on social media in real time. Additionally I posted and promoted an updated piece of cornerstone content. As a result I remained visible even though I wasn’t physically present in San Diego in a way that I wouldn’t haven’t been otherwise. 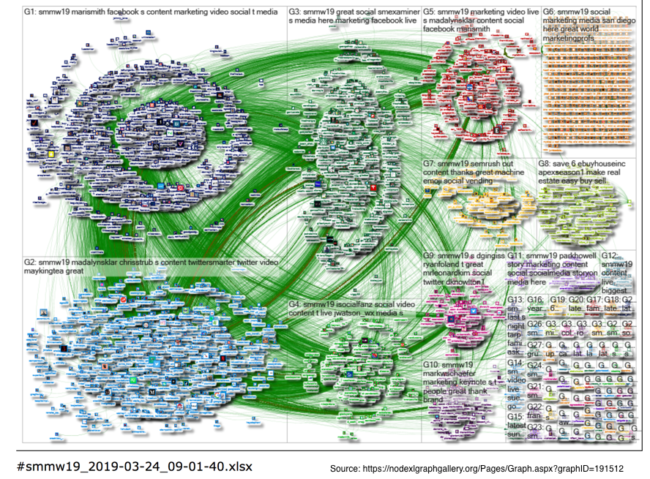 In fact, I even showed up on the map of SMMW19 Twitter interactions. Even better, I attracted new readers and new connections. But it wasn’t the full monty of conference marketing! Because I missed out on the real life connections and sense of community by being among my peeps. And this matters since meeting people face-to-face is how business gets done. As the saying goes, people do business with other people. 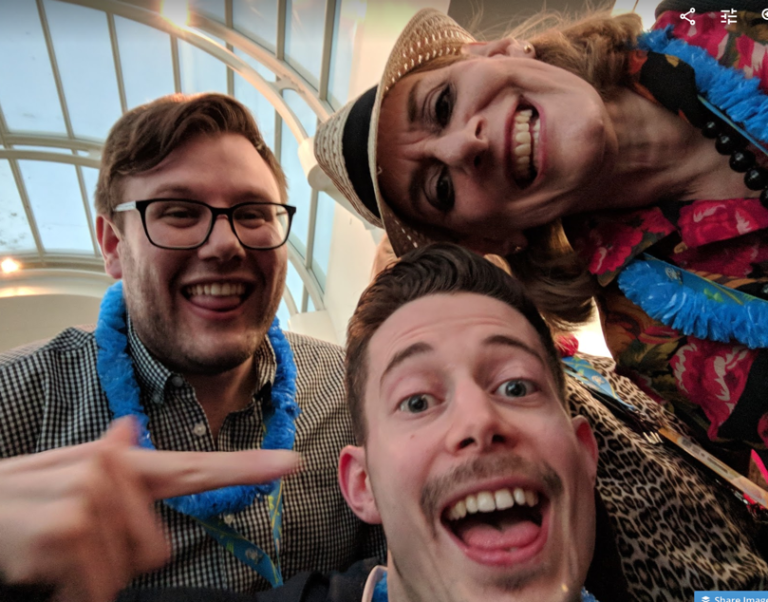 Since I couldn’t attend SMMW19 IRL, being there via social media and content was the next best thing! More importantly if I couldn’t attend another conference in-person, I’d do this again. Want to check it out before you subscribe? Visit the AMG Newsletter Archive. Tags Andrew and Pete, Andy Crestodina, Ann Handley, Cathy McPHilips, CMWorld, Conference, conference content, Curation, mari smith, Mark Schaefer, SMMW, Social Media. Bookmark the permalink.